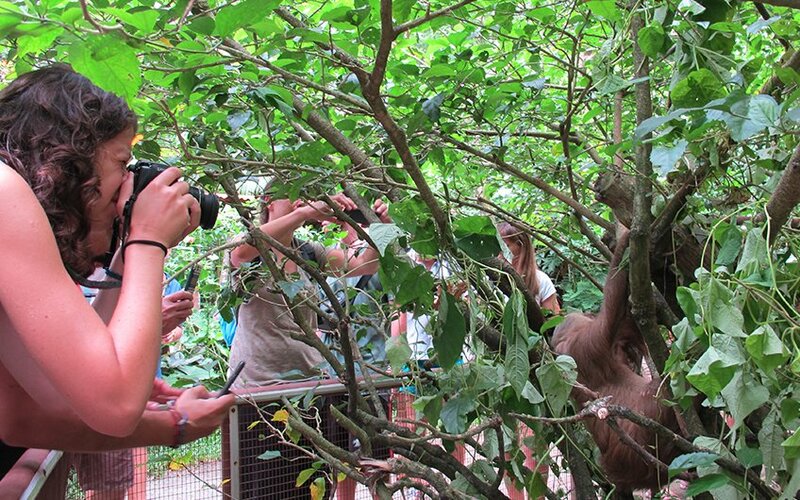 Sloths in Costa Rica are an even more growing target for visitors looking to get close to them. Their smiling faces and funny laziness are two of the reasons why people love them and look for them during their Costa Rica holidays. Their popularity is growing on social media and if you do not want to see them through a virtual screen or only in a post then you can consider a trip to this tropical place where they happily live. But do you know what is a sloth? If not, then you have to read this to get a better idea of what are these comic creatures and what are their main characteristics. 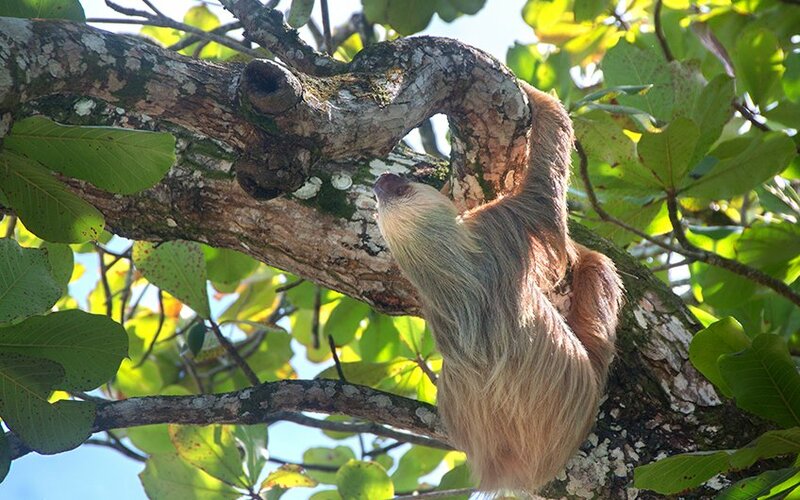 First of all, you may know that Costa Rica is an excellent place to spot sloths in their natural ambiance, as the country has the 5% of the world’s biodiversity and there are a lot of places where you can be so close of the natural sloth habitat, and this results very attractive for both, locals and foreigners. Their natural habitat is the forest, the trees specifically, where they hang out high while sleeping for about 20 hours a day. Yes, you read it right! They sleep for approximately 20 hours during the day. So, probably, when you spot one, or various of them, they will be surely taking a long nap. Sometimes you will be lucky enough to see them outlining a smile for your camera. Their name has something to do with this to: they move so slowly that they have a kind of algae growing on their fur, but this is not as bad as it sounds: having the fur this way serves as camouflage from the predators. Not only for their color, but also for their thick fur. In Costa Rica it is possible to find two species out of the six that already exist in the world. 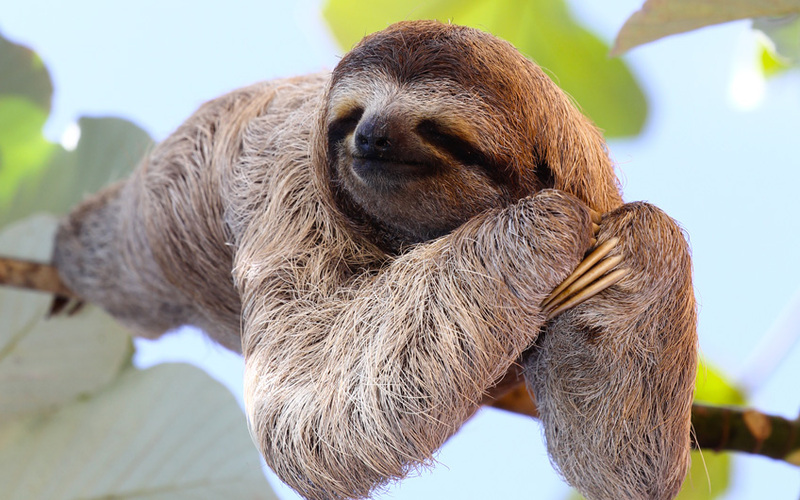 There are two types of sloths: the two-toed sloths and the three-toed ones. 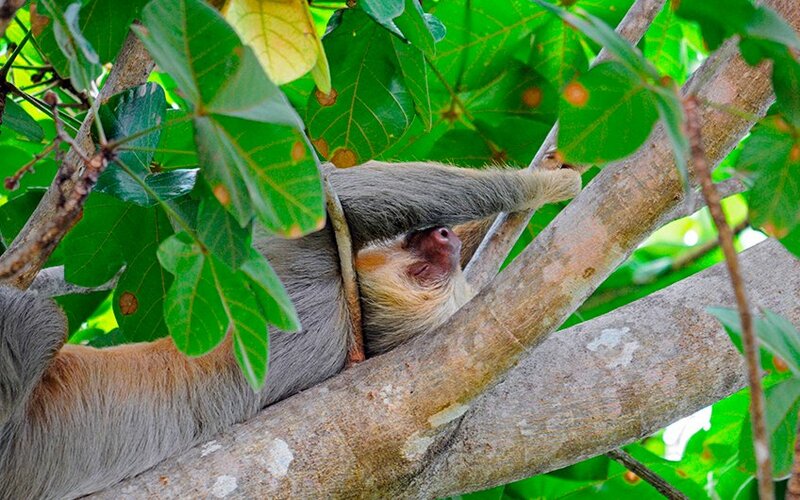 The species that can be found in our country are the Hoffman’s two-toed sloths which have two toes on the front feet and three toes on the back feet, and it is very common to watch them hanging in an upside-down position from the high branches during their daily nap. Its scientific name is Choloepus Hoffmanni. This species of sloth is nocturnal and this makes it much more difficult to find during a Costa Rica tour. But, if you are lucky enough to find them during the day, be sure that these little creatures will be probably (and almost surely) be napping. The other species that can be seen in Costa Rica is the Brown-throated Sloth or the Bradypus Variegatus, for its scientific name. This is the most common three-toed sloth in the world and it is a diurnal animal. Regarding their physical appearance you must know that they are a little bit smaller in size than the Hoffman’s sloth and also, other characteristic is that they are quiet more active than the other ones. Despite there are actually six species of sloths in the world, two of them are endangered. 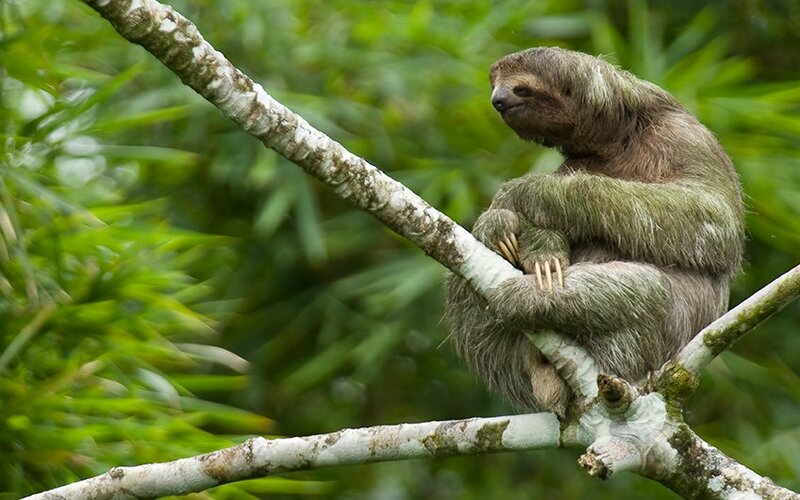 The Costa Rica sloths are not in danger but other species such as the Brazilian and the Pygmy sloth of neighbor country, Panama, are actually endangered. Here, the sloth sanctuary Costa Rica makes great efforts in order to keep these animals safe and provide a great sloth rescue process for the ones that have been in any kind of danger, or the ones that have lost their mother or something similar. The sanctuaries provide the protection, healthcare and other cares that they need, in order to preserve the species and keep them safe. It is very common that nature and animal lovers, and visitors of all kinds seek to be a sloth sanctuary volunteer and help their preservation through their work. This is a great experience that you can also live during your Costa Rica vacations, doing good is always rewarding and working with these smiling creatures will surely fulfill your spirit! In the country it is possible to find different Costa Rica animal rescue centers of different species, if you want to offer your time as a volunteer. Here you can learn a lot about them, help and donate your time or money to improve their life quality and, of course, take a lot of sloth pictures for your lifetime memories. Now, getting back into the curious information about them, you probably are wondering why they are so slow. Well, you need to know that their slow movements occur because of the fact that they have the slowest digestion system among all the mammals. Studies show that they require almost two weeks to fully digest a meal. Can you believe that! That is why, during their evolution process, their digestive system and their whole organism have evolved in order to keep energy. They evolved in order to do less, rather than to eat more. This is the main reason of their 20-hour naps. Curious, isn’t? Their food consists mostly in branches, leaves (their favorite ones are the ones of the cecropia trees), buds, and sometimes different insects. They are not predators, and almost in the same way, they have no much predators either. The main danger for them are the wildcats and the harpy eagles, but their few movements and their color that supports their camouflage make them a prey difficult to find. Despite its laziness, the sloths are amazing swimmers. Hard to believe, but it is truth! The sloths are related to armadillos and anteaters. The wild sloth can live up to 12 years. The sloths have a quarter of the muscle mass of other animals of their same size. The main differentiation between the two Costa Rica sloth species is their coloration. Three-toed tend to be color gray with a white happy face, while two-toed sloths tend to be beiger to brown. The three-toed sloths possess an extra cervical that allows them to turn their head 270 degrees. Amazing, right? Sloths are some of the most common Costa Rica animals (mammals) of the rainforest. Scientists estimate that sloths make up more than a half of the rainforest’s biomass in the South and Central America. Believe it or not, the sloths risk their lives to poop. Once a week they descend from their branches to poop and here it is when they risk their life, as being exposed in the ground. The reason why they do that is still a mystery for biologists. Sloths can spend the 90% of their lives in an upside-down position. Their fur works as an ecosystem as it supports different colonies of algae and moths. Researchers think, and are even more convinced, that they maintain these mini-habitats in their fur with its own feces. It may be one reason for their decision to descend from the trees to poop. For them, it can take up to 30 days to completely digest one leaf and they never eat too many leaves from the same tree in order to avoid poisoning themselves. The fungus in their fur can cure cancer, according to recent investigations. Where are sloths found in Costa Rica? Almost in every region it is possible to spot sloths. Just take a look! Here we give you some places to consider when looking for a Costa Rica vacation package if you really want to see sloth animals. You can visit one of the most beautiful beaches of Costa Rica in order to see sloths. Located in the Central Pacific, Manuel Antonio beach is an excellent spot for sloths. Here you can find both types of sloths. Monteverde Cloud Forest is a place that boasts 2.5% of the world’s biodiversity… just imagine it! Within the lush vegetation you will surely find the opportunity of seeing these nice creatures. The Corcovado National Park which is located on the southwest region of Costa Rica, specifically in the Osa Peninsula which is a biologically rich part of the country. The area contains 13 major ecosystems, so you definitely will have the chance to spot more than one of them during your vacation in Costa Rica. 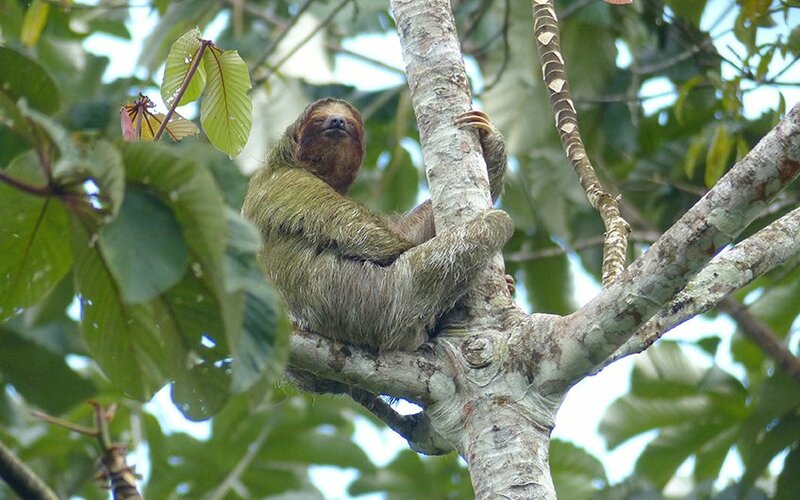 La Selva Biological Station is located in Sarapiquí and it is a protected zone operated by the Organization for Tropical Studies (OTS) and here it is possible to find sloths in their natural ambiance. Tortuguero with its canals, is a truly majestic and one of the best places to enjoy the wonders of nature. Then, you will see sloths here during the morning or the afternoon when taking the ecological boat tours offered by the different hotels and lodges of the area. And, if you have enough luck, probably you can see one of them swimming in the canals. Arenal is the famous region located in La Fortuna Costa Rica, is a great spot to see this kind of wildlife during a morning hike or while enjoying your free time in the hotel or the surroundings. You will be amazed by the landscape and the opportunity to see monkeys, different birds, and of course, sloths. There are a lot more of places where you can find sloths. Just to give you an idea, in the installations of the University of Costa Rica (UCR) many students and teachers have been able to see and be in close contact with these animals. And the UCR is located in San Jose Costa Rica, the middle of the city! We want you to have an unforgettable experience while traveling in Costa Rica, that is why we are going to give you some recommendations if you really want to see sloths. It is preferable to go with a guide or local that knows the area. Use neutral colors in your clothing. Be patient and always aware. Bring binoculars and good camera.